Come on! I can't believe none of you guys know this ship. I'll take a guess. The ship is an Independence class of light aircraft carrier. With the Harriers on deck, I am again guessing that it is the ex USS Cabot that was sold to Spain and renamed "Dedalo"
Correct!! It is the Dédalo (ex-USS Cabot). 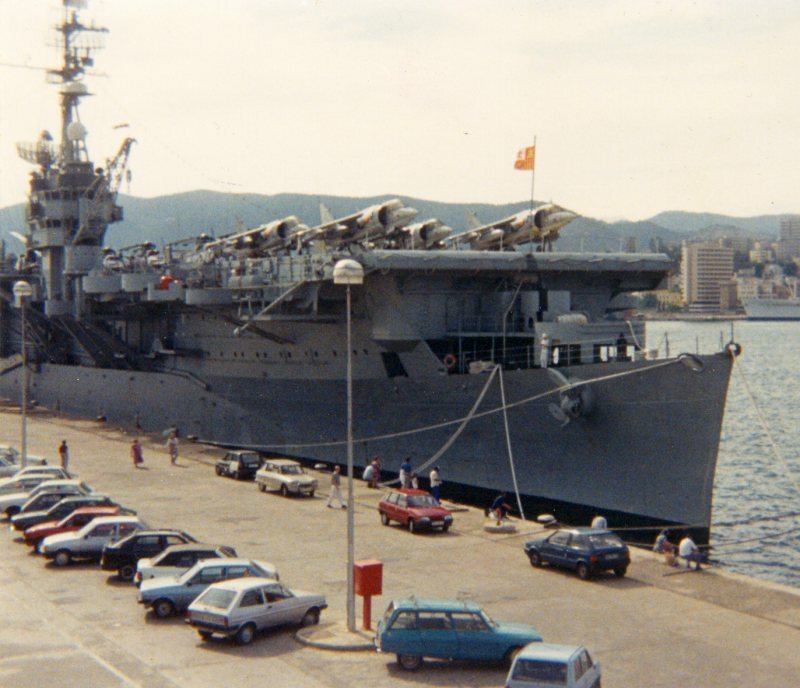 I took the picture myself in Palma de Mallorca back in 1989 shortly before the ship was decommissioned from the Spanish Navy. Thanks for posting this photo of the DEDALO. When the Dedalo was decommissioned the Spanish Navy donated the ship in 1990 so she could be preserved as a museum in New Orleans, but because of someone's incompetence and lack of funds our DEDALO was scrapped. What a shame! Someone who knows carrier history shouldn't have had any problems with that one, with the Spanish Navy flag at the forejack, and the Harriers on deck. They only had Dedalo. Nice photo. Too bad she met her end in south Texas.